Your copy of "Splash" has arrived! Download your copy of our newsletter here. 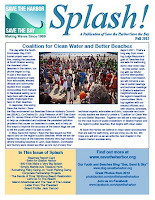 One of the best things about putting together each edition of Save the Harbor / Save the Bay’s newsletter “Splash” is that it gives us a chance to look back on what we have accomplished over the past months and what we hope to do in the coming year. By any objective measure, 2012 was a great year for Boston Harbor and for Save the Harbor / Save the Bay. In March, hundreds of people took part in the Harpoon Helps Cupid Splash, raising more than $30,000 to fund free events on the region’s public beaches from Nahant to Nantasket. This year more than 1,000 young people and their families joined us on one of our free weekend Marine Mammal Safaris in the spring thanks to event sponsor Mass Bay Lines, or on one of our free Treasures of Spectacle Island Cruises in the fall. This summer our 32 outstanding summer youth environmental education program staffers led 28 free All Access Boston Harbor trips to the Boston Harbor islands this year on a new boat, the Provincetown II. This summer we also ran our free Boston Harbor Explorers program at 8 sites around the harbor. Working together, our team connected more 13,545 youth and teens to Boston Harbor and the Boston Harbor Islands this year, an increase of more than 20%. In August, our Youth Beach Bash and Splash brought more than 650 kids to Carson Beach to celebrate clean water, while our Swim for Boston Harbor brought swimmers from as far away as Chicago to take part in a one-mile race on one of the cleanest urban beaches in America. This year we also began several important new policy initiatives this year, as we work to continue to improve water quality - and the quality of life - in Boston’s waterfront neighborhoods and the region’s beachfront communities. Over the coming months we hope that you will join our Coalition for Clean Water as we work with our Beaches Science Advisory Committee and the Metropolitan Beaches Commission, led by Sen. Jack Hart and Rep. Kathi-Anne Reinstein, to create a consensus on the next round of investment in Boston Harbor, our beaches and our future. We also hope that you will consider making a contribution to support our work. Thanks again for your support. We hope to see you on Boston Harbor again soon.